Although the quality of the material is good, a part of sewing is fine. Buttons are breaking. L size is for men whose height is 185 cm. Anyway it was too big for me. Please be careful when selecting the size. 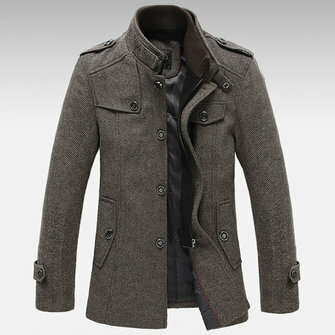 The jacket arrived as expected, with snug fit and stylish cut. I am pleased with it. Pekny kabat, prijemny material, dobre se nosi. Rozmery sedely podle tabulky co jsem nasel tady na webu.